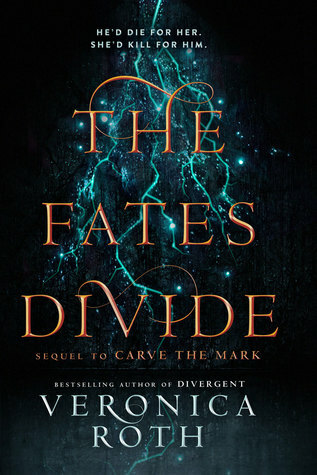 I went into reading The Fates Divide with two thoughts. My first thought was that either Akos or Cyra was going to die, just like (SPOILER ALERT) Tris dies in Allegiant and it was going to break my heart and give me the world's worst book book hangover and I wouldn't trust books again for months and would always assume the worst. This is exactly what happened when I finished Allegiant, FYI. Another FYI: I still gave it four stars because it was an incredibly well written book and it made me feel such strong emotion. In fact, if I was re-reviewing it today, I would give it five stars because it was a book that had the power to feel grief so vividly and experience such heartbreak for fictional characters. I also made it one of my Top 13 of 2013. My second thought was that I know a thing or two about oracles. I'm a HUGE fan of Rick Riordan's books, and anything that involves Percy Jackson inevitably includes oracles. And sometimes an oracle's prophecy isn't always what it seems. In fact, the face value is often not the whole story. It was my strong feeling that the title was exactly what I felt in my gut -- that in some way either Akos or Cyra, maybe both, had somehow already lived through their prophecy. My alternative thought was that if they hadn't somehow already lived their prophecy, their fate, that the oracles predictions for them weren't as deathly as they seemed. I mean Akos believed his fate to be this "The third child of the family Kereseth will die in service to the family Noavek." Akos and Cyra walked on eggshells and took even extra preventatives to escape this when the simple fact was he could've gone on serving his Cyra Noavek for dozens and dozens of years before dying of old age while still serving Cyra. That's just one simple way he could've died in service to the family Noavek, something no one ever bothers to consider, given what they know. Cyra's prophesied fate was that "The second child of the family Noavek will cross the divide." What I'm about to say is a little spoilery for Carve the Mark, but if you're here reading this review, I assume that you've already read CTM, so you know, proceed at your own risk. Ryzek forced Cyra to use her currentgift -- causing pain by touch -- on Akos and it both drained her physically and changed her currentgift thoroughly, in such a way that it was like she died. I went into The Fates Divide believing that in some way, this may have canceled out someone's fate and I was beginning to suspect that Cyra's fate was not what we were led to believe. 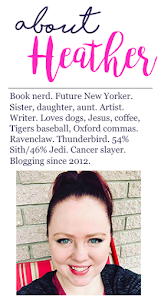 One concern I had for the book was that when I was reading reviews for Carve the Mark, I noticed a lot of negative reviews and a lot of people complaining about a "slow start" or too much to get into. Clearly, they don't understand that as with all things in life, but especially books, sometimes the greatest things take time. And I thought that might affect The Fates Divide. When last we left our infamous crew, they were aboard a ship and had just learned that Lazmet Noavek, who had been long thought dead by everyone, including his own family, dead at the hands of his evil son (and Cyra's brother) Ryzek. Turns out, he was just imprisoned the whole time and without Ryzek at the reigns to man things, he managed to escape and declare himself the true ruler of the Shotet, ready for any and all intergalactic skirmishes. One of the most jaw dropping moments of this book was learning that Cyra was not actually a Noavek by birth. She was born the third child of the Kereseth family, switched by her mother with Akos shortly after she was born. This meant that the fate that had been predicted for the third child of the Kereseth family -- "The third child of the Kereseth family will die in service to the family Noavek," -- was hers, not Akos. Likewise, Akos's fate was that "The second child of the family Noavek will cross the divide." I rarely use GIFs in my reviews but I feel this one was particularly appropriate. Even though I knew something was not as it seemed with their fates, I did NOT suspect in the slightest that they had been switched at birth. However, as I had sort of predicted, Cyra DID live out her fate when she was forced to torture Akos. Akos, on the other hand, felt he had crossed the divide many times. During this novel, they spent a portion of time on the planet Ogra, which receives almost no sun, yet is filled with plants. Plants have to get their sustenance somewhere, if not from sunlight, then by eating. Yes, the planet is covered in carnivorous plants -- this is literally a nightmare for me. So I tried not to think about this too much, though. One character who died at the the end of Carve the Mark was Ori. This was frustrating because I would've liked to get to know Ori. But as the twin of Isae, the chancellor, it was her fate. I just had hoped it wouldn't have come so soon. As soon as Ast, Isae's childhood friend showed up, I knew he was no good. He was suspicious from moment one. His attempt to kill Cisi wasn't even well thought out. We went SO many chapters though without one from her, part of me was sure she was dead. I was so relieved when she turned out to be well. Of course the biggest challenge for the characters in this book is killing Noavek and there are many conflicting thoughts on how best to do it, including attacking the entire Shotet nation. Before Lazmet reclaims the throne, Cyra tries to take the throne to arrange a peaceable solution, but Isae, grieving the loss of her twin sister Ori, wants blood. Also during this novel, we see Cyra and Akos apart for a large part of the novel, both intent on killing Lazmet, but in different ways. The end of the novel does see Lazmet's rule coming to and end as dies. The addition of the extra voices really filled out this novel and made it feel more well-developed than the first book -- and I enjoyed it more than Carve the Mark. In short, every moment of reading Carve the Mark is worth it, even if it does drag a bit, simply because it leads you to this -- it's just like dining. You have to have all your dinner and your vegetables before you get to the amazing dessert. 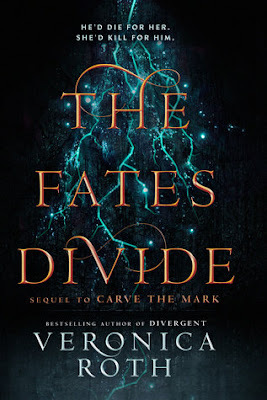 And as far as dinners go, Carve the Mark is so great and its sequel, The Fates Divide, is even better and is so worth the wait!